Separation Anxiety Or Unhappy Puppy? Is My Puppy Suffering From Separation Anxiety? This is the second night home with my 8 going on 9 week Cocker Spaniel. I run him until he can barely open his eyes at night thinking that a tired puppy won't care where he sleeps as long as he's sleeping. The first night he cried for 2 hours and the second night for 3. He is so tired that he can barely open his eyes buy he whines and barks until it's unbearable. I was wondering if this is usual? He takes naps in his pen and doesn't mind it a bit and he hates to leave it! Yet when it's nap time and he's put into his kennel, he gets upset. Is this separation anxiety or a puppy getting used to his new home? This sounds very much like your Cocker Spaniel puppy is missing his mother and his litter-mates, and you're right, he's also having trouble adjusting to his new (and unfamiliar) environment. 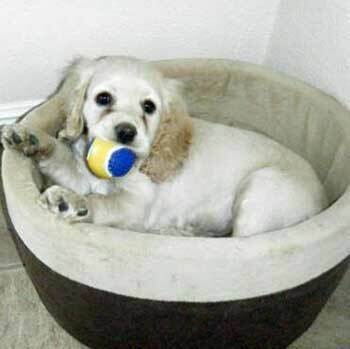 Tire your puppy through gentle play and then take him to his toilet area before putting him into his crate at night. I don't recommend you pick him up when he cries as he'll only learn that each time he cries, you go to him. If he's fed, warm and comfortable, and doesn't need the toilet, it will be better for you both if you leave him. He'll soon learn that night time is for sleeping. I'm not sure what you mean by a kennel but I'm assuming that it's indoors (as it should be). It sounds like he loves his pen (very much like a crate) and I suspect that it's in a family room so that he can see what's going on. If you crate train your puppy it will be much easier for you both. A crate is a den-like space for a puppy and will help him to feel safe and secure. Crates are great for helping with potty training your puppy too! I recommend you read the above articles - they will help you and your puppy to get through the first few nights. A Tired Puppy Will Sleep Almost Anywhere! You're also right when you say a tired puppy will sleep almost anywhere, however, one word of caution about his exercise. Puppy's bones are still very soft and at this stage, his exercise should be kept to a minimum so as not to damage the delicate bones. If your puppy is not yet fully vaccinated (and I suspect he won't be at this stage) you'll need to exercise him by playing indoor puppy games with him to tire him out. If your garden is safely enclosed, you should be able to exercise him there too. Once he's vaccinated and it's safe to take him outside, a gentle 10-minute walk, twice each day, should be sufficient for his little bones. The very act of socializing your puppy and giving him puppy obedience training should, at this stage, give him a little extra exercise. When your puppy is about 5 months old, you should be able to increase his walks to 15 minutes, twice each day, gradually adding a few minutes to his walks each week. You can then build up slowly until your Cocker can comfortably manage a one-hour walk each day, or more if he and you want it! If you need it, there's lots of help and information on my puppy care page and this article will give you some great tips and ideas on setting up a puppy care routine for him. I wish you lots of luck and hope you enjoy your puppy! Comments for Separation Anxiety Or Unhappy Puppy? You might also like to try making his kennel seem a fun place to be. Play with him while he's in there, reward him for going in, the same as you would for training him to use his crate. If he falls asleep during the day, gently place him in his kennel.